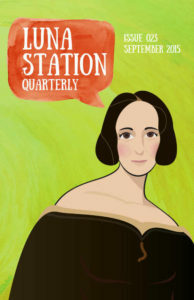 Year Six of Luna Station Quarterly continues, with our All Fantasy / Fairy Tale / Mythology Issue! (It wasn’t on purpose. Honest! These things just happen sometimes … ) From an old forest to the far side of the moon, from the Garden of Eden to the mysterious quiet of a faery gravesite, these stories continue the lineage of wonder, creepiness and subtle subversion that Luna Station has become known for. Join us, as the days of Summer wane, and let these ghosts, golems and mapmakers lead you into the unknown, and back again.